Above is a screen-grab from the CTV news website (associated with “Canada’s largest private broadcaster“). I copied it at 5 pm on December 12th. Half an hour later, this particular photograph – of a banner that reads: Save the planet, scrap capitalism – had been replaced by a less incendiary one. 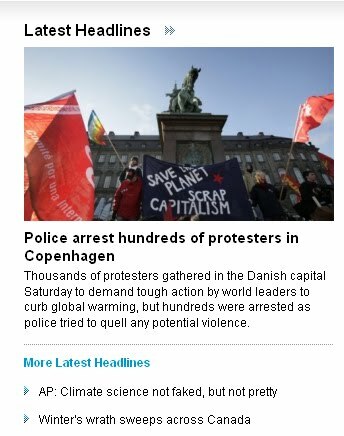 People traveled to the United Nations-sponsored climate conference in Copenhagen for a variety of reasons. Some of them protested in the streets of the Danish capital, some didn’t. Of those who did, most demonstrated peacefully. Others donned masks and hurled bricks through windows. In other words, they’re a diverse bunch. We do, however, need to be honest about one thing. When Conservative, right-leaning folk accuse environmentalists of being “watermelons” – green on the outside and Red on the inside – they aren’t pulling this accusation out of thin air. There is, indeed, a portion of the environmental movement that sees capitalism as the problem. Never mind that capitalism is strongly correlated with prosperity and freedom. Never mind that socialist governments in China and the Soviet Union murdered tens of millions of souls during the 20th century. Never mind that socialist economies are typically basket cases – and that socialist governments have a long history of suppressing the basic freedoms of their citizens. Despite all of this painful experience, some people still think it would be cool to tear down capitalism. Many of these folk have jumped on the environmental bandwagon because they think it will help them achieve their real goal. If this is more than just the latest installment in the on-going battle between left and right, Liberal and Conservative, greens and industry, why do you continue to behave as though it’s business as usual? If it’s really, truly important to get as many people on board as quickly as possible why don’t you act accordingly? Why are you not loudly distancing yourself from the capitalism-is-the-problem crowd? Why aren’t you reassuring us that we needn’t fear for our political structures? Why aren’t you telling everyone – on all sides of the climate debate – that the conversation about whether our particular political systems are right or wrong must wait for another day? That we must now focus all of our attention on climate issues. Those who wish to argue for the destruction of capitalism have a right to free speech and should not be silenced. But environmental leaders – including all the politicians, celebrities and media commentators yakking on incessantly about climate – need to distance themselves from the “scrap capitalism” bunch. Until that happens, don’t expect me to share your sense of urgency. It looks like just another media circus to me. Plenty of drama – but no real substance. This entry was posted on December 13, 2009 by Donna Laframboise in ethical & philosophical, media and tagged capitalism, Copenhagen 2009, Marxism, media, United Nations.